One of the least well kept secrets of this year is the new range of TomTom GO hardware. Well it is official now. At CeBIT today TomTom have released details of a completely new range of GO GPS Navigation systems. Due to hit retailers from mid april these represent a major update to the popular navigation system. There are three models in the range: an entry level GO 300, a mid range GO 500 and the flagship GO 700. All these devices share a common software platform which will be available for existing GO users. Click here for the PocketGPSWorld.com review of the new GO Software TomTom GO 5. The review is based on the original GO and does not include the features of the new GO hardware range. All of the new GO navigation systems feature Bluetooth and are tightly coupled with mobile phones. To take advantage of this connectivity TomTom have released a new value added service for all the new TomTom Navigator platforms called TomTom Plus. We have prepared an article describing the features of TomTom Plus here. Starting at the bottom of the range the TomTom GO 300 is very similar to the current TomTom GO the main addition is Bluetooth. This allows the GO 300 to be connected to a mobile phone to take advantage of TomTom Plus features, including TomTom Traffic. The GO 300 is based on a 200MHz processor with 32Mb of system memory. Looking at the images provided the windscreen mount has been modified. Hopefully this will be an improvement on the original one. Interestingly TomTom have really cut costs on this model as it doesn't come with a mains adapter, not that it is required. It also lacks ASN which is present on the current GO. The next model in the range is the TomTom GO 500. This has all the base functions of the GO 300 but this time it has a faster processor running at 400MHz. The GO 500 also has the option of a remote control as an accessory. The GO 500 takes the integration of Mobile Phone telephony so much further and allows the GO to become a bluetooth hands free communications device. Another feature of the 500 is a special cut of maps which include your country or region and the rest of the Major Roads of Europe on the card as well allowing you to navigate right across Europe. These maps also include the Major Roads of the Baltic countries, Poland and the Czech republic. (Sort of hints at what may be available in terms of mapping later this year). At the top of the range is the flagship TomTom GO 700. This has all the features of the 500 plus so much more. 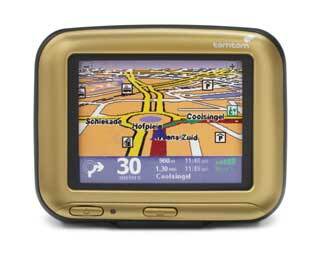 The picture of the GO with the gold fascia above is that of a TomTom GO 700. There is one thing that distinguishes it from the normal GOs... It doesn't have a slot for the SD card. Why is that? Well simply because it has a stonking great 2.5GB hard disk tucked away inside it. Why would you want 2.5GB? Well the answer is to store the entire street level maps of Europe on. This really does allow you to route seamlessly from your current location to anywhere in Europe. The TomTom GO 700 also comes with the Remote Control as standard. When I was a kid I used to love a program called Knight Rider (OK so my boys were kids). KIT, the car, was able to talk to Michael Knight and advise him what to do and then to provide communications back to head office etc. Well the GO can do that now as well. With the TomTom GO 500 and TomTom GO 700 you get an additional icon labeled "mobile phone" whilst we were testing the new software we wondered what this was. Initially we just assumed that it was for TomTom Mobile 5, but now we know better. 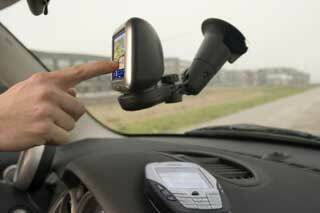 Mobile Phone takes you to the Hands Free car kit. Tapping Mobile Phone brings up the following screens. As you can see you get a full mobile phone interface. Allowing you all the functionality you would expect from a hands-free system but with a much more user friendly user interface thrown in. Our initial verdict is: WOW . We knew TomTom were up to something, but this? OK sort of. We had our wish lists and TomTom has managed to put a tick in just about every single box. Well we will let you know after we have really had a good play with them. The best thing about today is that we are at CeBIT and will be talking to the TomTom directors, and hopefully a play with the new toys. We will update this article when we have had our little tete-a-tete. CeBIT, 10 March 2005 – TomTom, a leading navigation solution provider, today announces the launch of a new range of the award-winning TomTom GO all-in-one navigation device. The new range is comprised of three models (TomTom GO 700, TomTom GO 500, TomTom GO 300) and provides a navigation solution to meet all users’ needs. The TomTom GO 700 is TomTom’s full feature, top of the line all-in-one navigation device. It was developed for the most demanding consumers who want the fullest navigation experience. TomTom GO 700 is equipped with voice communication capabilities that enable it to be used as a hands-free kit for Bluetooth-enabled mobile phones. By connecting to the driver’s phone via Bluetooth wireless technology, the driver can safely and comfortably take and make calls while navigating from A to B. The hands-free functionality works so easily that your phone can even be in your bag or pocket. Simply tap the GO screen to accept a call or to make one and talk through the GO while you drive. The TomTom GO 700 routes calls automatically from your mobile phone through the integrated speaker and microphone with professional sound quality, while the screen continues to show you where to go. You can make calls in the same way, and you can even access your mobile’s phonebook through the GO . The unique integration of GO and your phone is seamless and users will benefit from the bigger screen and clearer UI (User Interface) than is found on mobile phones and hands-free kits. With this feature there is no need to fit costly phone specific hands-free kits that are time consuming and expensive to install and that need to be re-installed when either the car or the phone is exchanged. The TomTom GO 700 has a high capacity internal hard disk that comes pre-installed with full, street level maps for Western and Eastern Europe. As a result driving door-to-door across Europe is now completely seamless. The TomTom GO 700 gives you door-to-door spoken and on screen instructions anywhere from Lisbon to London, from Brussels to Bologna. A remote control comes standard with the GO 700. Ergonomically designed for maximum driver and passenger comfort, the remote control can now be used whilst driving to ensure drivers’ eyes are kept firmly on the road. a suitable Bluetooth enabled mobile phone. (see separate press release) TomTom PLUS is a bundle of services that provide r eal time information on traffic congestions, weather conditions and extra downloads such as detailed city maps, additional voices, points of interest and much more. The TomTom GO 500 comes with pre installed detailed map of your country connected to the Major Roads of Europe map all pre-installed on an SD card. You can go door-to-door across entire country and can seamlessly find your way to any town across Europe using the Major Roads of Europe map. In addition, TomTom GO 500 has the same hands-free functionality as TomTom GO 700 via Bluetooth-enabled phones. 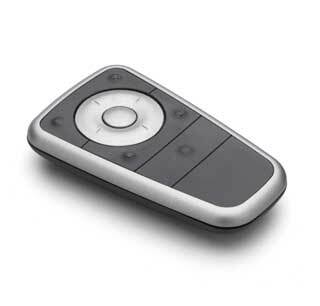 A remote control can be bought separately for the TomTom GO 500. Additionally, TomTom GO 500 is ready for TomTom PLUS services through a suitable Bluetooth enabled mobile phone. Completing the new GO range is TomTom GO 300. TomTom GO 300 features all the great navigation of the award-winning TomTom GO at an accessible price. TomTom GO 300 offers the latest street-level map of your country that includes details for each town and city. Additionally, it is ready for TomTom PLUS services through a suitable Bluetooth enabled mobile phone. Millions of points of interest including parking, petrol stations, hotels and restaurants with an optional automatic alert option as you approach one. The new GO devices will be available from major retailers from mid April 2005. Pricing will be announced shortly.